In regard to the fourth allegation, it's worth pointing out that they found no evidence to support it. However, not being scientists, they've decided to appoint a panel of science professors from the school to investigate more thoroughly. They state that they think an investigation by scientists is more likely to satisfy the ankle-biters. Also, the report states emphatically that Mann's cleared of all research misconduct allegations. The sad thing is that its not even in the editorial section. That headline is a bona fide news story! It doesn't matter when the PSU administrators' findings on allegation 4 are "rubber stamped" by an investigatory committee composed of Mann's faculty members, the baying mob will never let go of Mann. They can't. He's effectively the pseudosceptics' keystone to all their fallacious endeavours. They've invested too many years in demonising him to let go. sort of playing devil's advocate here --- I think the real failure is allowing Mann, who represents what, .01% of climate scientists, or actually, a narrowly specific "area" of the climate science (dendro/tree ring analysis) --- to shape the debate and become the poster boy. let's face it, there were a lot of egos at play here between Mann/Jones et al, and they stifled McI's requests all the time (yeah McI is also an egotistical prat). Now I know that behind closed doors the climate modellers may have been laughing at Mann et al & their "importance" all these years, but in the end he & his colleagues have really screwed things up across all the areas, at least sociopolitically if not scientifically. So that's the real tragedy i.e. that the "debate" was allowed to form around the hockey stick all of these years. and yeah I'd say the IPCC has effectively dropped the ball because of this and global warming is moving into a "disaster recovery" stage and ideas that we can "prevent" things have become ludicrous (at least from my view from the states). @Carl C: how did Mann "shape the debate" exactly? His hockeystick was used in the SPM for AR3, but he himself wasn't on every news outlet at all. In fact, you'll be hard pressed to find *any* interviews with him. Same actually goes for Phil Jones. Oh c'mon, of course Mann et al put the "hockey stick" front & center in the IPCC TAR, and everyone has had to rally around it since then until it took on a life of it's own. and it's really such a minute part of climate science or global warming, i.e. this specific attempt at proxy reconstructions that can be picked apart and "hardly" reconstructed. Carl C --- Actually these hockey stick reconstructions are rather important. There are well over a dozen such and no, Mann et al. is not primarily dendro. The dendro can be left out and the conclusions still hold. Please attempt to understand why I wrote the first sentence. 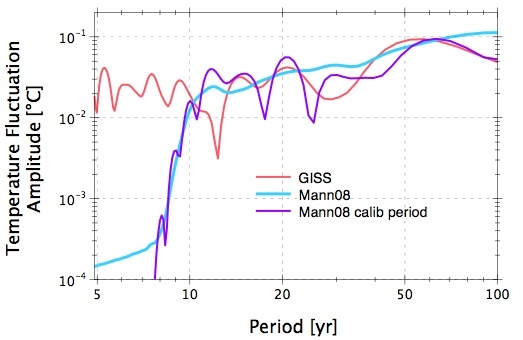 There are far more impressive & important things & "harder" science in climate science than the various (sometimes irreproducible ;-) "hockey sticks", of which the Mann et al version was Cinderella at the ball but now it's 10 minutes past midnight. It was as dumb to rely on that & prop it up as it was for the "glaciers gone by 2035" ilk. It's just unbelievable with the feuding & hand-wringing over stuff like uniform priors & detection & attribution etc, that stupid whoppers like the hockey stick & "glaciergate" get into the IPCC reports just fine (presumably because those sections are driven more by ego & the desire to"make some noise" than actual science). So while there may well be more important matters, you appearantly are not ready to understand why hockey sticks are important, not to be lightly dismissed. I'll not attempt to change your mind as it is clearly made up. haha SPM, it was in the TAR years before. The IPCC has been regurgitating it for years after that in an effort to "show support" & try and save some face after all the McI & von Storch. It seems far more about "rallying the troops" than real science. The SPM for the TAR, published in the same year weren't they, in 2001? Whether contemporaneously, within days, or within weeks I can't exactly recall now. But I think the full TAR (CUP) came a month or two later than the SPM for the TAR (Jan/Feb 2001?). Or is there some other point I'm missing here, Carl C? Just to clarify - I'm talking about the SPM for FAR in '07 - not the TAR of '01 where the "hockey stick" was unveiled in IPCC reports. anyway the point (if it isn't lost by now) is that IPCC still felt like propping this up even after it was called into question, audits, revised studies & intercomparisons etc. Ergo it became more about satisfying egos than any "hard science." Carl C --- Well, its about using sound statistics on multi-proxy geophysical time series. Not much room left for egos, provided all agree on the soundness of the statistical techniques. But if you can actually call the methods used into question, please do write it up and submit to a suitable statistics journal. Not E&E, by the way. you've got to be kidding right? because I'm no fan of McI & McK, but they've basically built a career on the "sound statistics" of Mann et al; not to mention von Storch et al. Which led us all to this climategate mess etc because they just became fixated on the spin & egos & "control freak" nature of academic publishing. David B Benson: "But if you can actually call the methods used into question, please do write it up and submit to a suitable statistics journal." There are problems with Mann's methods, they fail simple verification tests, like whether his analysis preserves natural fluctuations or not. That said, I didn't see anything to object to in the report. Did you Carl C? Carrick- it isn't clear that you know anyting about climatology. What has spectral whatitsname got to do with anything? Why do you complain about hockey sticks when every piece of research since then shows a hockey stick shape? And finally, why havn't you written this up for E&E? there's a guy named Hans von Storch, you may have heard of him, who knows a little bit of statistics, and climate. I think he wrote a big book on it. And he's published his critiques of the hockey stick. You can look him up on google or wikipedia. and jeez, just from a casual look at the "Climategate" code, you can practically make their data sing the Star-Spangled Banner if you want to, let alone make a "killer smoking-gun hockey-stick." I can see the problem --- these various proxy reconstructions are only as good as the data and the integrity of the scientists in it. Otherwise you can cherry-pick & process or "massage" things however you want. Hence they are a pain to reproduce, and ultimately seem to become "faith-based science." and I don't mean "integrity" in that they are all evil Karl Rove/George Bush scumbags who want to destroy the earth in their favor. Maybe they're just scared of their jobs or egotistical prats and 'circled the wagons' and got caught out by leaked emails, which would have looked funny if we could see leaked emails between Steve McIntyre & Senator Inhofe & Pat Michaels & Fred Singer et al. I mean hell at least given a version of a climate model, parameters/input files, compiler brand & version, and hardward & O/S, you can make reproducible climate runs (if not bit-reproducible). but tweaking any of the above I can probably get a run, even an ensemble, to do what I want (I've played with enough permutations of compilers & optimization levels & compiler flags to see this). So my point in this long ugly thread (sorry James for hijackimg your blog again ;-) is I think the battle of "trust" in the area of proxy-reconstruction hockey-sticks has been lost publicly. and now stuff like the "glaciers gone in 2035" just adds some more fuel to that fire. I wonder if "UEA hackers" & skeptics will now turn to climate models, though, other than the usual "these guys can't predict the weather a day ahead, how can they do the climate in 100 years" etc. guthrie: "What has spectral whatitsname got to do with anything? " It's important because any time-domain signal (like a temperature reconstruction) can be decomposed into frequency-domain components using something called a "Fourier transfer". The frequency domain components (AKA "spectral components") are a signature for a particular process or series of processes (e.g, ENSO or PDO in climate fluctuations). Converting the time series to the frequency domain is one way to test whether a temperature reconstruction successfully "captured" the temporal fluctuation of the climate it is trying to reconstruct. But to be blunt, if you lack the training to understand why this matters, you really should pick another topic to argue about. Your opinion about Fourier decomposition, as an untrained observer, wouldn't be particularly valuable, would it? "Why do you complain about hockey sticks when every piece of research since then shows a hockey stick shape? " Who is complaining about hockey sticks? In truth, it matters not to me whether the MWP was warmer or colder than the current decade, and I think the current decade based on the best data is likely warmer than the MWP. If I were to tell you the right way to simplify "16/64" is to cross out the "6"'s would you think this is a good method simply because it arrives at the correct "1/4" answer? Similarly, Mann's analysis method could be wrong, and he could still get the right answer. Disproving a given method says nothing about what the true answer really is. Understanding the right method in this case is more important to me than the eventual answer. I've got to admit, you can write a good reply. But somehow I still don't quite get why your critiques are correct, insofar as your reasonablty effective attempt to explain what you are talking about (I know it in english, but can't do the maths) lack any kind of review, apparent acceptance into the body of scientific literature, etc. As for complaining about hockey sticks, that was CarlC, not you, I just kind of saw you agreeing with him, when he was posting inflammatory weird stuff that misses the point of the history of the hockey stick and its place in the literature. Interesting stuff anyway, Carrick. Not sure I understand it yet. So what you're saying is that 1/f noise is fluctuations that if they occur rapidly, are of small size, and if they occur more slowly, are of larger magnitude. Spectral analysis of paleoclimate data does show pink noise (1/f noise) at decadal scales which becomes redder the longer the period so that at millennal scales it is about (1/f^1.6) noise. 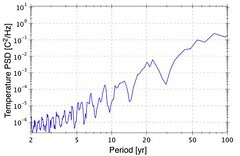 So a sample of that might look sorta like a hockey stick except that the last part of the hockey stick has a pronounced high frequency component which is statistically improbable using just an statistical ARMA(p,q) model of climate. OK, so what do you say to that, Carrick? I find I learn quite well when people argue about something and I get to compare what they say. As for CarlC, I find him using hyperbolae and concern trolling. Another thought is to do a wavelet analysis of the hockeystick data to observe the pink noise for most of the time and then the high frequency components during the modern period. That wouldbe another way of seeing the vary different character of the modern trend. If PSU decided to hold an inqury on such flimsy evidence, shouldn't George Mason University consider one for Edward Wegman and Yasmin Said? David Benson: "Another thought is to do a wavelet analysis of the hockeystick data to observe the pink noise for most of the time and then the high frequency components during the modern period." I guess my take is it is a mistake to associate it with pink noise. 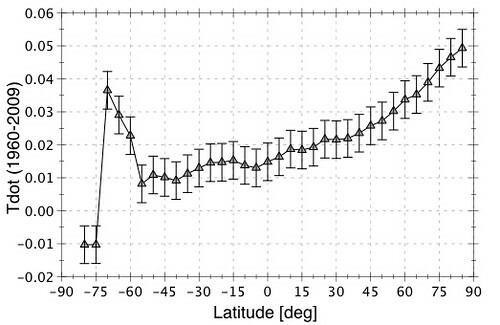 Climate "noise" is the result of a series of coupled atmospheric-ocean oscillations with discrete frequencies, and an amplitude that depends on 1/f. Also, in looking at the frequency content of individual proxies, I don't see evidence that the modern period has an increase in amplitude high frequency components. Though I admit I haven't looked at this in any real depth. Anyway, why would you assume an increase in amplitude of higher frequency components? As I understand it, the primary driver of large-scale ocean atmospheric fluctuations (periods a year to hundreds of years) is the temperature difference between the equator and the poles. This is hardly a unique finding of course (I don't know of it being published anywhere, separate issue), but as I understand this, this weakening of the Hadley Cell circulation a standard consequence of global warming predicted by the climate models.